We target the difficult problem of catching in-flight objects with uneven shapes. This requires the solution of three complex problems: predicting accurately the trajectory of fast-moving objects, predicting the feasible catching configuration, and planning the arm motion, all within milliseconds. We follow a programming-by-demonstration approach in order to learn models of the object and the arm dynamics from throwing examples. We propose a new methodology for finding a feasible catching configuration in a probabilistic manner. We leverage the strength of dynamical systems for encoding motion from several demonstrations. This enables fast and online adaptation of the arm motion in the presence of sensor uncertainty. We validate the approach in simulation with the iCub humanoid robot and in real-world experiment with the KUKA LWR 4+ (7-DOF arm robot) for catching a hammer, a tennis racket, an empty bottle, a partially filled bottle and a cardboard box. Biomimetic robot designs attempt to translate biological principles into engineered systems, replacing more classical engineering solutions in order to achieve a function observed in the natural system. This chapter will focus on mechanism design for bio-inspired robots that replicate key principles from nature with novel engineering solutions. The challenges of biomimetic design include developing a deep understanding of the relevant natural system and translating this understanding into engineering design rules. This often entails the development of novel fabrication and actuation to realize the biomimetic design. This chapter consists of four sections. In Sect. 23.1, we will define what biomimetic design entails, and contrast biomimetic robots with bio-inspired robots. In Sect. 23.2, we will discuss the fundamental components for developing a biomimetic robot. In Sect. 23.3, we will review detailed biomimetic designs that have been developed for canonical robot locomotion behaviors including flapping-wing flight, jumping, crawling, wall climbing, and swimming. In Sect. 23.4, we will discuss the enabling technologies for these biomimetic designs including material and fabrication. This climbing robot can scale flat, hard vertical surfaces including those made of concrete, brick, stucco and masonry without using suction or adhesives. It employs arrays of miniature spines that catch opportunistically on surface asperities. The approach is inspired by the mechanisms observed in some climbing insects and spiders. This chapter presents a discussion of modular robots from both an industrial and a research point of view. The chapter is divided into four sections, one focusing on existing reconfigurable modular manipulators typically in an industry setting (Sect. 22.2) and another focusing on self-reconfigurable modular robots typically in a research setting (Sect. 22.4). Both sections are sandwiched between the introduction and conclusion sections. This chapter is focused on design issues. Rather than a survey of existing systems, it presents some of the existing systems in the context of a discussion of the issues and elements in industrial modular robotics and modular robotics research. The reader is encouraged to look at the references for further discussion on any of the presented topics. ATRON robot showing robust and reversible execution of self-reconfiguration sequences. Many companies have proposed new robots to help with the Fukushima reactor decommissioning process. This is one of many such promotional videos. This chapter presents an introduction to the kinematics and dynamics of parallel mechanisms, also referred to as parallel robots. As opposed to classical serial manipulators, the kinematic architecture of parallel robots includes closed-loop kinematic chains. As a consequence, their analysis differs considerably from that of their serial counterparts. This chapter aims at presenting the fundamental formulations and techniques used in their analysis. 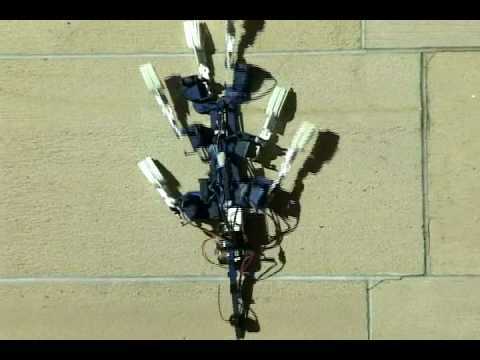 This video demonstrates a 3-DOF high-speed 3-RPS parallel robot (with A3 head). Multifingered robot hands have a potential capability for achieving dexterous manipulation of objects by using rolling and sliding motions. This chapter addresses design, actuation, sensing and control of multifingered robot hands. From the design viewpoint, they have a strong constraint in actuator implementation due to the space limitation in each joint. After briefly introducing the overview of anthropomorphic end-effector and its dexterity in Sect. 19.1, various approaches for actuation are provided with their advantages and disadvantages in Sect. 19.2. The key classification is (1) remote actuation or build-in actuation and (2) the relationship between the number of joints and the number of actuator. In Sect. 19.3, actuators and sensors used for multifingered hands are described. In Sect. 19.4, modeling and control are introduced by considering both dynamic effects and friction. Applications and trends are given in Sect. 19.5. Finally, this chapter is closed with conclusions and further reading. The PISA-IIT SoftHand is a anthropomorphic device with a single actuator. The video shows the hand being controlled with EMG signals. In this chapter, we introduce modeling and control for wheeled mobile robots and tracked vehicles. The target environment is rough terrains, which includes both deformable soil and heaps of rubble. Therefore, the topics are roughly divided into two categories, wheeled robots on deformable soil and tracked vehicles on heaps of rubble. After providing an overview of this area in Sect. 50.1, a modeling method of wheeled robots on a deformable terrain is introduced in Sect. 50.2. It is based on terramechanics, which is the study focusing on the mechanical properties of natural rough terrain and its response to off-road vehicle, specifically the interaction between wheel/track and soil. In Sect. 50.3, the control of wheeled robots is introduced. A wheeled robot often experiences wheel slippage as well as its sideslip while traversing rough terrain. Therefore, the basic approach in this section is to compensate the slip via steering and driving maneuvers. In the case of navigation on heaps of rubble, tracked vehicles have much advantage. To improve traversability in such challenging environments, some tracked vehicles are equipped with subtracks, and one kinematical modeling method of tracked vehicle on rough terrain is introduced in Sect. 50.4. In addition, stability analysis of such vehicles is introduced in Sect. 50.5. Based on such kinematical model and stability analysis, a sensor-based control of tracked vehicle on rough terrain is introduced in Sect. 50.6. Sect. 50.7 summarizes this chapter. 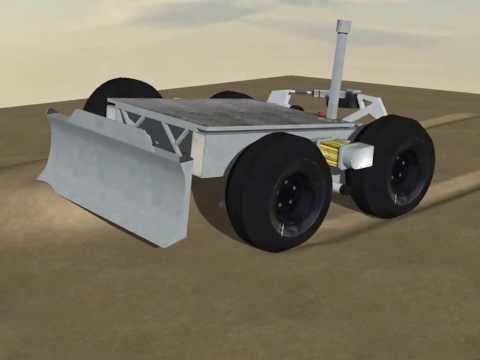 This video is an animated dynamic simulation of a vehicle traveling on sandy terrain. The simulator carefully considers mechanical interactions based on relationships between the wheel and the terrain and between the tool and the terrain. In particular, a discrete-element method is employed in order to represent the tool-sand interactions. This short video explains what "region pointing" is. While it known that there are a variety of pointing gestures, in region pointing, unlike in other pointing gestures where the pointing arm is fixed, the arm moves as if it depicts a circle, which evokes the region it refers to. Robotic manipulators use contact forces to grasp and manipulate objects in their environments. Fixtures rely on contacts to immobilize workpieces. Mobile robots and humanoids use wheels or feet to generate the contact forces that allow them to locomote. Modeling of the contact interface, therefore, is fundamental to analysis, design, planning, and control of many robotic tasks. This chapter presents an overview of the modeling of contact interfaces, with a particular focus on their use in manipulation tasks, including graspless or nonprehensile manipulation modes such as pushing. Analysis and design of grasps and fixtures also depends on contact modeling, and these are discussed in more detail in Chap. 38. Sections 37.2–37.5 focus on rigid-body models of contact. Section 37.2 describes the kinematic constraints caused by contact, and Sect. 37.3 describes the contact forces that may arise with Coulomb friction. Section 37.4 provides examples of analysis of multicontact manipulation tasks with rigid bodies and Coulomb friction. Section 37.5 extends the analysis to manipulation by pushing. Section 37.6 introduces modeling of contact interfaces, kinematic duality, and pressure distribution and soft contact interface. Section 37.7 describes the concept of the friction limit surface and illustrates it with an example demonstrating the construction of a limit surface for a soft contact. Finally, Sect. 37.8 discusses how these more accurate models can be used in fixture analysis and design. This video demonstrates sliding or toppling of a pushed object depending on the support friction coefficient, the object's center of mass location, and the pushing force, as illustrated in Figure 37.8.